It’s the late 1980s and The Real Ghostbusters is burning up the airwaves with its unique blend of adult-minded horror and comedy, pushing the boundaries of what is “acceptable” for a kid’s show. Like any other media juggernaut, the show’s name was slapped onto anything you can imagine: from toys to household products to food items. As part of the 30th anniversary celebration, we’ll take a look at the various games made for the show. The American version box art. The American version game board. 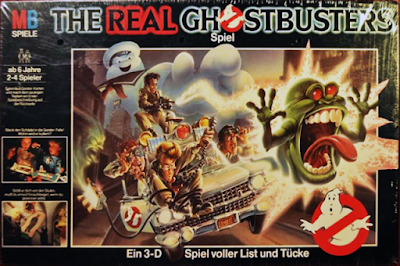 The German version box art. The flattened German version game board details. Milton Bradley updated their 1970 board game Which Witch? to accommodate The Real Ghostbusters. 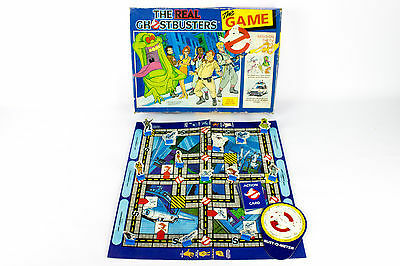 The game is played on a 3-D board where players had to move their Ghostbuster around and avoid perils in order to collect four ghost cards and make it to the top of a set of stairs. 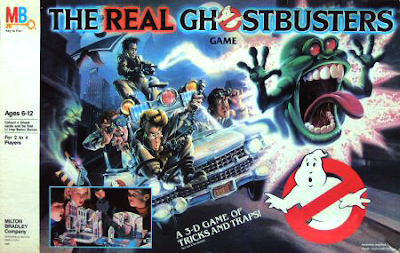 The game made extensive use of promotional stock images for the player pieces and the box art, which featured the Ghostbusters in the tan uniforms from the movie and promotional pilot episode. In fact, all the ghosts featured in the game were present in the pilot. In 1990, the game was re-released in Germany and featured all-new and significantly more detailed board art. The first Real Ghostbusters video game was a top-down shooter where up to three players would traverse ten levels blasting various kinds of ghosts and avoiding environmental perils. However, the game had very little to do with the show beyond the name and cabinet art. 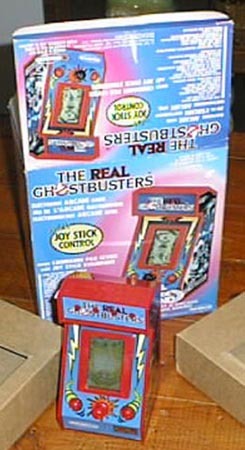 In fact, it was a modified version of the Japanese arcade game Meikyū Hunter G with the enemies changed into ghosts and Ghostbusters elements added. The in-game characters didn’t resemble their animated counterparts, and the only way to tell them apart was by the color of their uniforms (which, again, didn’t match the show). Ghostbusters logos were used to increase the firepower of the proton gun, while ghost traps were used to refill the beam’s energy meter. Slimer would float around the player to shield them from attacks while potions would make them invulnerable for a time. Skulls drained the proton energy quicker. Despite the lack of connection to the show, the game went on to become the second best-selling arcade cabinet in the United Kingdom. The game was ported to the Amiga, Amstrad CPC, Atari ST, Commodore 64 and ZX Spectrum with varying degrees of comparative quality. It's a game and practically a PDA! 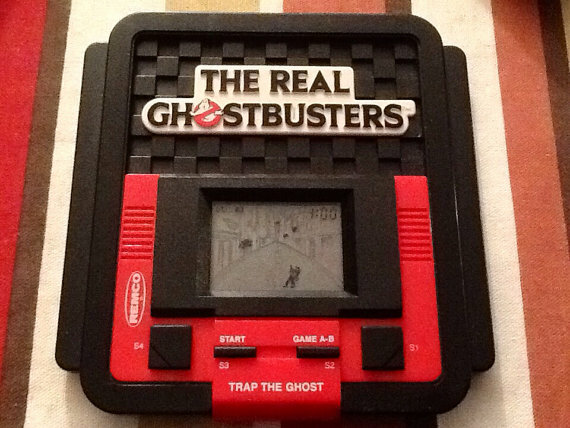 The Real Ghostbusters shrunk in size for their next outing for an LCD handheld game. The game featured the same premise as Space Invaders; a series of ghosts would come down the screen at increasing speeds as the levels progressed, and the player, as Peter, had to move back and forth along the bottom in order to “blast” them. When not in use, the game could serve as an alarm clock and calendar, with a little kickstand to prop it up. The box and game board. The Triotoys board game once again made extensive use of promotional artwork for the series. 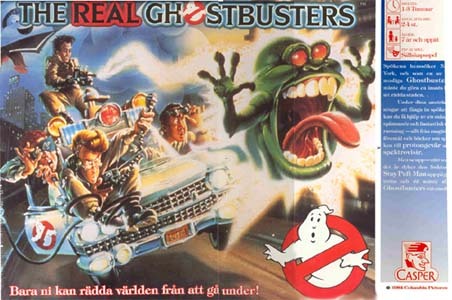 Notably different was the fact that Janine and Slimer were included as playable characters. 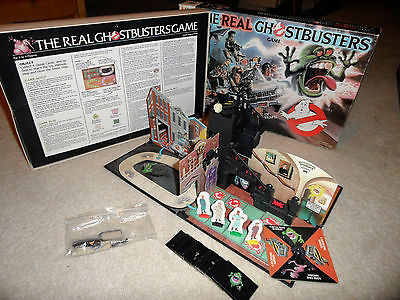 The game made extensive use of cards to dictate actions and depicting the equipment a player needed to collect before being able to capture ghosts. These ghosts weren’t just waiting around to be busted, as they came on stands similar to the player characters and could be moved around the board as well as the spinner described. 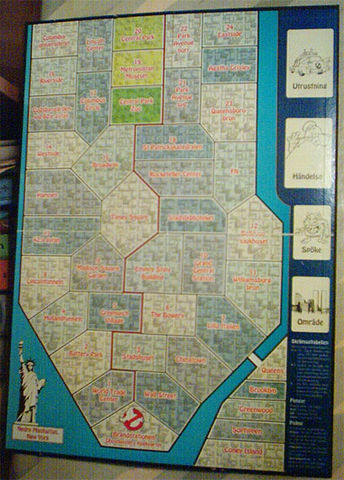 The game board, a map of lower NYC. While the box art for this Swedish game looked similar to the Milton Bradley version, it was markedly different. The game board this time was a modified map of lower Manhattan. Rolls of the dice determined where a player would move and if they were successful in catching a ghost. Unsuccessful busts resulted in the player being slimed and the ghost flying off to be faced later on. Each bust was determined by a mission card and added points, which players need in order to purchase their busting equipment and win. Each character also had a special skill which helped them or added a handicap during gameplay. The game had a degree of difficulty in that if Mr. Stay Puft appeared, he could destroy the firehouse and cause every player to lose. Like the other board games, the game made extensive use of promotional artwork (although Peter’s player piece gave him blonde hair). The game also featured model sheets for the firehouse and several of its rooms. Remco took the LCD game a bit further by putting one inside a miniature arcade cabinet adorned with the promotional painting artwork. While the previous game was set on a city street, this one was set in a mausoleum. The player once again controlled Peter, and this time he had threats coming at him from every direction. The player shifted Peter’s position with the joystick and could press one of two action buttons. An added feature was that Peter could duck down to avoid an attack. However, his hiding time was limited and once it ran out, Peter would lose a life and an animation of him lying in a coffin on the background would appear. Although the box came in English, the game just saw a limited release and was widely available in Italy. Another Remco LCD left the arcade format and went into the pinball arena. The game was smaller than the standard tabletop pinball games but was closer to its big cousins with the addition of long legs holding it up. 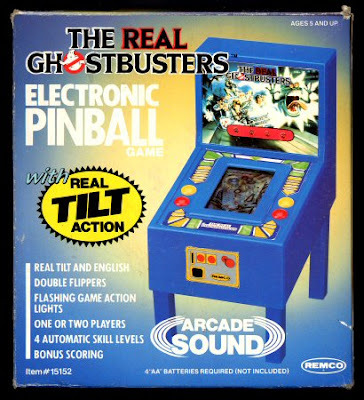 The game simulated the pinball motions over its playfield. Once again, the picture used to decorate it was the painted promotional artwork. The game itself came in red and blue, while the box was colored either blue or orange. One of the popular pieces of tie-in merchandise in the late 80s/early 90s were battery operated miniature tabletop pinball machines. They were just like regular pinball machines with lights and sounds, but were only about 2 feet long and lacked some of the digital scoring methods. Sharon Industries produced one for the cartoon. 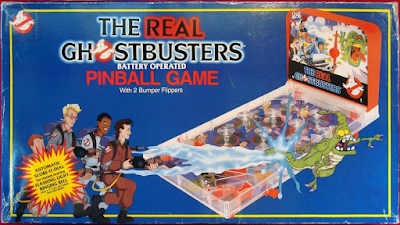 While the playfield featured the characters as they appeared on the show and some stock generic ghosts, the back board was the promotional art painting. The next Real Ghostbusters handheld game was released for the Nintendo Game Boy by Activision. 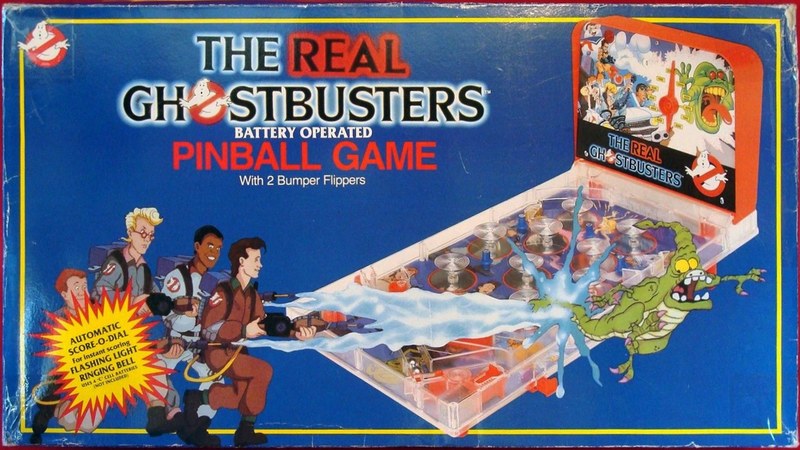 Once again, it was not originally a Ghostbusters game and had very little to do with the actual series. The game, developed by Kemco, was an action/puzzle game where players had to maneuver through labyrinths by destroying certain blocks, using bombs to defeat enemies, and collecting all the stars in a level to get the key that will open the door to the next stage. The game was originally part of Kemco’s Crazy Castle series and featured Disney’s Mickey Mouse as the primary character in Japan, where it was known as Mickey Mouse IV: The Magical Labyrinth. For European countries, the game was modified to star Garfield and was called Garfield Labyrinth. The North American version got Peter and The Real Ghostbusters branding. Despite having a proton pack, the beam was only used to break blocks and bombs were still needed to destroy enemies that couldn’t be avoided. Some stages would also feature the Ghostbusters theme in rotation with the game’s original music.